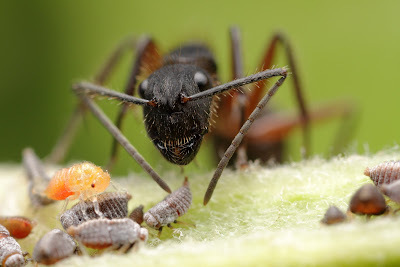 These ants feed on the nymph's honeydew drops, the nymphs get it from the vegetation and feed the ants in exchange of protection, I believe the honeydew even increase the ants agressiveness as they become more active and prone to attack when near a scene like this. My ambition was to capture a image with the ants at the moment of feed and this group of nymphs produced small drops in relatively frequent quantities, the site for the capture was selected in base of this. Macro photography favour stop motion usually with flash photography, there's a balance where the challenge is to produce the best possible frozen moment, at the magnification that give at the same time detail and surroundings information (usually increasing the magnification results in huge light losses) with the less possible flash time. Macro photography also favour low iso. Unfortunately in this first photos where affected by motion blur to some extent (longer flash times to work with the small apertures needed to capture two subjects interacting in one frame photo). Usually the macro technique for insects involve reduce movement by the photographer side and by the subject side, reducing the subject side usually is done by the use of sugar, some substances that work as anaesthetics, or taking the shoots at cold hours where the insects are motionless. 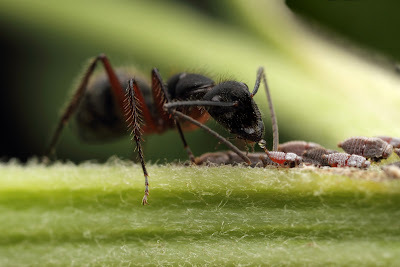 Unfortunately the objective of wasn't to take the pictures of ants, or of the nymphs, but photos of the interaction of them so reducing subject motion is not desired in this circumstance. The best I could imagine for this is reducing the flash duration time while at the same time using narrower apertures to increase depth of field, this time raised the iso to 500 (proved to not harm this much the pictures, noise still under control) and was possible to reduce the flash time. This increased the rate of keepers and proved to be a good solution for a situation where the subjects where relatively unpredictable. For reducing the motion at my side I used a monopod (not used in the first photos) to reduce the fatigue waiting for a moment in a relatively uncontrolled scene This scenes were in a bush at 1.20m from ground so the monopod helped with the need to keep the gear lifted for longer time. Looks the difference of exposure and aperture to not be that big among these two pictures, but the second one have better histogram distribution and a much smaller flash time than the first resulting in a more detailed capture. Personally I prefer the moment of the first photo, but the second I consider better technically, even at 200% magnification the noise differences weren't noticeable (the same amount of noise reduction was used in the two pictures). As a disclaimer, raising iso's at macro photography is a techinique of exception, most of the time the subjects weren't this active to require raising iso's and the flash itself do a good job stopping the motion. Great shot, spent the better part of a week trying to capture a similar image with ants and tree hopper nymphs last summer without any luck. the beautiful Foto!! highly interesting!! !